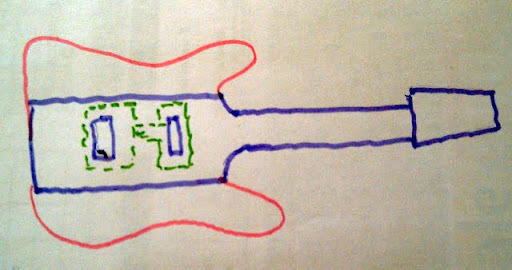 This is a crude drawing of how I'm thinking of making the guitar. 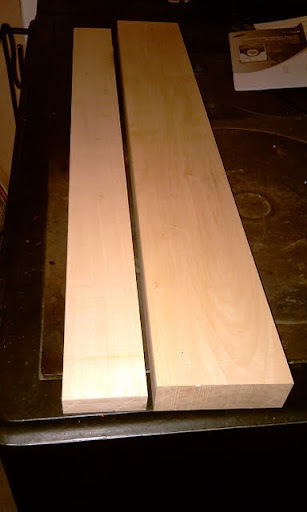 I'll try to leave the maple wide at the actual body part to house all hardware well and support mics and all. Just add flanges on either side. The green dotted line means I'll have the body cavity open from the back rather than front (if I can use a router carefully enough) for easy access to swap mics and such. Nice lookin' tree parts, there! I like the neck through idea too.